Availability: Ships in 5 days or less! Presto P3-AA Pallet Positioner making building and breaking down pallet loads has never been easier. The unit raises and lowers automatically as boxes are added or removed from pallets. Workers don't have to bend or stretch to place boxes on the pallet. A turntable top allows the load to be rotated which eliminates the need for workers to walk around the pallet. 400 - 4500 lb holding capacity. 21" vertical travel. Sealed ball bearings for easy turning. 7-ply reinforced rubber airbag. Load and unload pallets without stooping, stretching, or walking. Automatically maintains pallets at a constant level and comfortable working height as layers of boxes are added or removed. Leveling is accomplished by a heavy-duty, reinforced rubber airbag that can handle loads up to 4500 lbs. After airbag charging with shop air is complete, the P3 All Around can be disconnected and moved to any location in the plant. Because the P3 is pneumatic, it can accommodate loads that vary substantially in weight (from 400 - 4500 lbs.) so one unit is versatile enough to work in several areas. A turntable top with easy turning anti-friction bearings allow users to spin loads. ♦  Capacity: 400 - 4500 pounds. ♦  Overall Base: 36-1.4" wide x 36-3/4" long. ♦  Lowered height: 9-1/2" and 27-3/4" raised height. ♦  Platform size: 43-5/8" diameter. ♦  Fork pockets: 6-3/8" wide x 1-3/4" high on 29-3/8" centers. ♦  Automatically positions loads between 9-1/2" and 30-1/2". ♦  Stable design requires no floor lagging. ♦  Built-in fork pockets facilitate relocation to multiple work areas. ♦  Full 360 degree rotation. ♦  1/4" x 43" solid rotating platform. ♦  Lifetime warranty on Firestone Actuator. ♦  Small base allows workers to stand up close to the P3-AA at any position. ♦  Shipping weight: 400 pounds. Load and unload pallets without stooping, stretching, or walking. The P3-AA Pneumatic Load Leveler automatically maintains pallets at a constant level and comfortable working height as layers of boxes are added or removed. Leveling is accomplished by a heavy-duty, reinforced rubber airbag that can handle loads up to 4500 lbs. After airbag charging with shop air is complete, the P3 All Around can be disconnected and moved to any location in the plant. Because the P3 is pneumatic, it can accommodate loads that vary substantially in weight (from 400 - 4500 lbs.) so one unit is versatile enough to work in several areas. A turntable top with easy turning anti-friction bearings allow users to spin loads so they are always working from the near side without having to walk around the unit. Capacity: 400 - 4500 pounds. ♦ Overall Base: 36-1.4" wide x 36-3/4" long. ♦ Lowered height: 9-1/2" and 27-3/4" raised height. ♦ Platform size: 43-5/8" diameter. ♦ Fork pockets: 6-3/8" wide x 1-3/4" high on 29-3/8" centers. ♦ Automatically positions loads between 9-1/2" and 30-1/2". ♦ Stable design requires no floor lagging. ♦ Built-in fork pockets facilitate relocation to multiple work areas. ♦ Full 360 degree rotation. ♦ 1/4" x 43" solid rotating platform. ♦ Lifetime warranty on Firestone Actuator. ♦ Small base allows workers to stand up close to the P3 at any position. ♦ Shipping weight: 400 pounds. 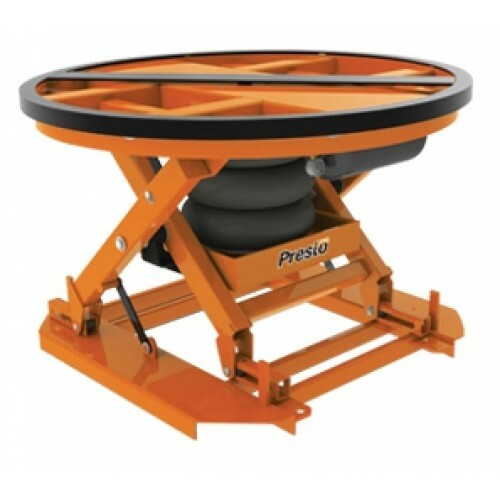 Presto Lifts Self-Leveling P3-AA Pallet Positioner added to your Quote list!